The idea for this painting came from reading a passage in George Bird Grinnell’s book on the Cheyenne Indians, volume 1. This paragraph is a small part of his description of wedding activities: "When the girl set out she was dressed in fine new clothing, but after she had been taken into her mother-in-law’s lodge, the sisters or cousins of her husband took her to the back of the lodge, removed the clothing that she wore, and dressed her in new clothing they had made, combing and rebraiding her hair, painting her face, and hanging about her various ornaments as gifts.” I have taken artistic license on one part of the painting – as I have shown her to have a red ribbon wrap on her braided hair. 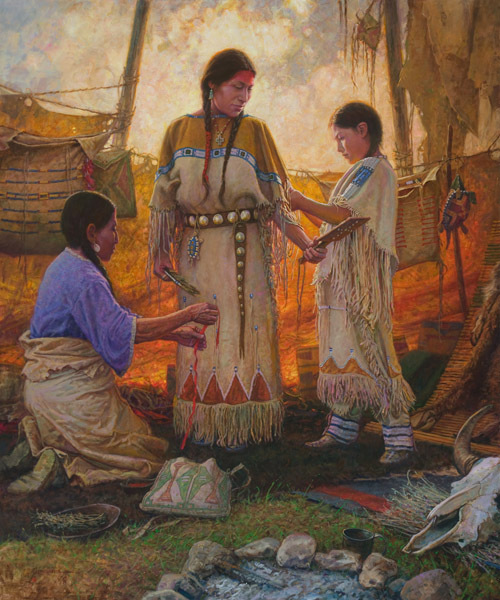 Traditionally, Cheyenne women did not wrap their braids, but I thought it added an extra interaction between the girl & her helper, who has the ribbon in her hands & is preparing to wrap the second braid – and I considered it as part of the "ornaments” given as gifts. The buffalo skull sits in the traditional position of the lodge used as an altar, and is sitting on a bed of sage. Various other items adorn the lodge, including storage bags & parfleche cases, a willow backrest, a tin trade cup, etc. The small beaded pouch hanging from the bride’s belt, in the shape of a turtle, holds her umbilical cord – a tradition among many Northern Plains Indian tribes. The cord was dried & placed in the pouch after the child’s birth, and was kept throughout their lifetime.